Scouts can sign up for upcoming events from the My Stuff - Sign Up For Events page or from the Troop Calendar. Parents can use these pages to sign up their families. 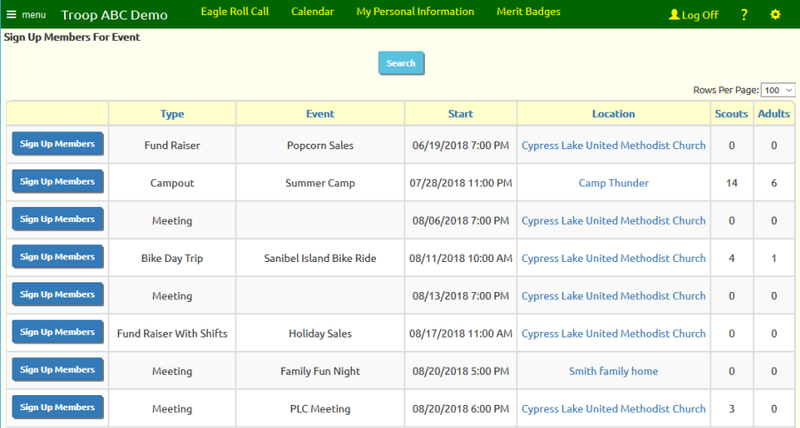 Authorized leaders can update the sign up status for all members of the troop using the Sign Up Members For Event page available from the Calendar menu. This page begins by displaying a list of upcoming events which have an Event Type which allows members to sign up. Click the Sign Up Members button for the event you wish to update. The columns displayed on this page will vary based on how the Event Type was configured for this type of event. For example, the Permission Slip column will only appear if this Event Type has enabled the Display Permission Slip Checkbox for Participants option. Click the Yes button next to each member who plans to attend the event. Click the No button next to any member who has indicated he does not plan to attend. For any member who has been set to "Yes", you can enter the number of guests they plan to bring along, if the Event Type is configured for this option. Adults can be designated as drivers, regardless of whether they are signed up for the event, if the Event Type is configured for drivers. For each driver, indicate whether they are driving to and/or from the event, and the total number of seats in their vehicle. Use the Comments field to indicate other information about this person, such as alternative travel plans or the names of guests.